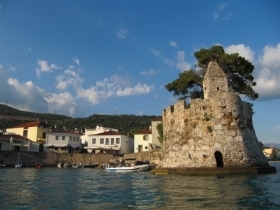 A lot has already been written about Greece and Turkey, this is a great cruising area with many open air museums around each corner waiting to be explored, it is fantastic area with many coves and anchorages to choose from most of which are spectacular. We are only writing about our own experience. Our main objective was not to frequent marinas or harbors but at the same time visit as many places of interests as possible given we only had a 90 day visa in Greece, instead we prefer to anchor out in the breeze, away from mosquitoes, noise and rats. We found many good anchorages especially going through Greece. Our main ground tackle consists of a 66 lb Spade anchor set on a bowsprit, with 220 ft of 3/8” HT galvanized chain marked at 1st 6ft (means anchor up just below the surface ready to be cleaned) and every 50 ft and the last 10ft indicating the last part. Therefore we are limited to depths of no more than 44ft with a scope of 5:1 or 31 ft with a scope of 7:1 for storm conditions. All this is controlled with a 1500 watt vertical windlass that includes a capstan and gypsy. We have anchored with a 3:1 scope with no problems as long as we know what the weather is like and how good the holding is or if it’s for a short time. We planned our destination according to the weather forecast we gathered and made sure we would have a safe anchorage for the length of time we planned to spend on the hook in a particular spot. We left Malta early May 2011 after waiting for a decent 3 day window to carry as towards mainland Greece a distance of about 350nm. Here we cover the places that we stopped at after leaving Malta all the way to Turkey. Our first landfall was Katakolo in the Adriatic Sea; we anchored in 10 ft of water over sand and weed. Just north of the harbor entrance, very good hold. Checking into Greece is a two-step job, first you go to immigration where you are issued a cruising log, good for 6 months at a cost of €30.00 passport was looked at but not stamped as we came from another EU country, then you take all the paperwork downstairs to the harbor police and if you are in the marina/harbor you pay, if anchor there is no charge. We checked out the harbor and there was only 4 other boats stern to with their anchors down as there is no laid moorings. The boat yard seems to be functional but we never seen anyone working and the marina office was always closed in the few days we went buy. This is a cruise ship terminal as it is very close to Olympia, one of the most important ancient archeological sites in all of Greece. The town has a small supermarket, many tourist shops, and restaurants on the waterfront. You can visit Olympia buy bus or a short trip on a train that only costs €5.00 per person. To get a Greek SIM card for your phone or modem you will have to go to the next town of Pyrgos, there you will find more shopping and supplies of any kind you need. The ancient city of Olympia is must see site. Word of caution, while we were happily anchored we had some easterly come in, the crews on the boats that were stern to in the harbor could not get off or on to the boat as a swell was making its way into the marina. Lagana Bay is a big bay located on the south of the island most of the bay is a restricted area as it is a loggerhead turtle breading ground and one can only anchor at the SW corner near a small fishing harbor. There is nothing ashore except a few villas but the bay is spectacular and the holding very good in 18 ft over sand. While at anchor we had sustained winds of 20kts and gusts of 30kts. On the way into the bay we encountered two mating turtles; you cannot miss these turtles as they are huge. We anchored in 12 ft over sand just SE of the harbor, this is a small harbor where you can tie up your boat on the inside of the outer quay. Ferries go in and out and we did not go ashore here as this was an overnight stop. It does have good protection from the Maltemi but is open to the N to East. We motored in very light airs the 45 nm distance to Navpaktos and anchored just south of the harbor entrance in 30 ft over sand. The harbor can only handle about 8 boats stern or bows to, we did not notice laid lines here so you will have to use your anchor. Navpaktos is a medieval harbor built around the 11th century; it is well preserved and is surrounded by cafes and restaurants. The climb up the hill to the old town is easy walk and the view of the Gulf of Patras and Gulf of Korinthos from the top is incredible. 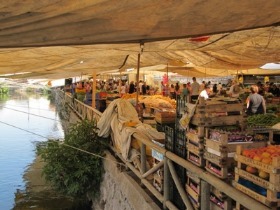 The town itself is a good place to provision from; supermarkets are close by on the main road. We did not intend to stay here long as the anchorage is only protected from the north so any westerly’s will roll in this far. We left the next day to our next spot. We anchored in 23 ft over tall weeds and mud, the holding is good once you penetrate the weeds. This island offers the best possible anchorage this far. It is protected from all around and you can leave the boat here over winter at the marina. It is a 10 min ride by boat taxi to the mainland. On the island there limited provisioning, a few restaurants which most of them we believe are closed during the winter months. It is a very relaxing place to spend a few days and work on some chores on the boat. There is some short walks around the island. We anchored on the north bay in 10 ft over sand and rubble, the holding is good, protection all around you may get a chop from a strong northeasterly. 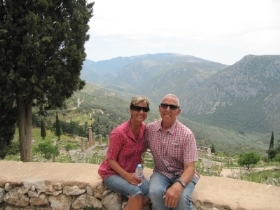 The town is pretty with narrow streets and a few restaurants in the waterfront, bakeries and a few super markets, there is a bus to Itea and from Itea you can take another bus to Ancient Delphi, this is not to be missed. 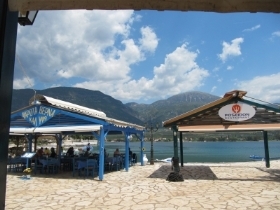 If you go to Delphi make so that you get back to Itea before the 21:00 hrs bus leaves for Galaxidi, as there is no busses between 13:00 hrs and 21:00 hrs. The better option would be to go and anchor some place close to Itea or go to the Itea harbor where you can tie up alongside at certain times of the year. Itea is a big city with all the services although lacking boat chandleries. Anchor close to the town wall in about 35 ft over sand, holding is very good, it does look to close to the fishing boats tied to the will but it is fine, we spent 3 nights here with no problem, very good protection from all around. You can also tie up stern or bows to the harbor which is actually a break-wall but there is no laid lines. Good provisioning in town, many restaurants in the waterfront. There is a military bay across the bay; it is restricted to go even close to it. We anchored in over sand and clear water, well protected from the Bora Bora or the Maltemi but open to the west, the scenery is spectacular but the ashore we were disappointed with the lack of anything, just a lot of summer houses for the Greeks. No provisioning, but there is a well-equipped hardware store. We anchored in 15ft over sand with very good holding open only from the west. This is another spectacular anchorage with potentially three areas for anchoring, NE, area near small boat harbor, Middle of the bay in front of the restaurants and SE corner; they are all very nice anchorages with excellent holding. We were the only boat at anchor in the 3rd week of May but the restaurants were open and we also visited the medieval fortress, the entrance is free to this site, you can actually see the fortress from the anchorage. There is a small chapel within the castle. In town there is some provisioning and a small hardware store plus a nice bakery. This place is worth a stop. Anchored in 42ft over unknown bottom but the anchor grabbed on the first try, there was no noise from the chain dragging on the bottom as we swung back and forth, so I assume it is mud or sand, no weeds showed up on the anchor when we left, it has good protection from mostly everywhere except west… This is a Greek tourist town, the Greeks from Athens drive here to their summer or weekend houses, it looked very busy from the boat as we did not go ashore, this anchorage was for as to be close to the Korinthos Canal entrance which we went through the next day. This is the only place we decided to go into a marina so we stayed for a couple of days at Zea Marina, for a very reasonable cost of €38.00/day during the last week of May. 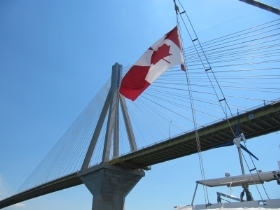 This is a very convenient place for re-provisioning, purchasing boat parts and of course to visit Athens. To go to Athens you take a 20 min walk over the hill to the main commercial harbor area from there you take the subway or metro to the center of Athens, you can easily spend a day or two in Athens especially if you like walking, for us it was our first time and a great experience. There are other anchorage options to the north east of the entrance into Zea Marina. After spending 2 wonderful days in Athens, we headed out and south towards Aegina Island. Now that we had entered the Aegean Sea we had to keep a good eye on the weather forecasts, but since it was still late May, the dreaded Maltemi had not started to blow as a matter of fact we hardly did any sailing up to this point. So we decided to head south a little to visit Aegina and Poros, then head up NE to Sounio on the mainland and after that it would be a nice track SE towards Turkey, so even if the Maltemi appeared they would be on our stern quarter, and we would be able to sail with just the genoa. Up to this point we had very good free wifi with open access while at anchor or we would go to a bar and download any weather to our IPod Touch which gave us a few days of weather forecasts with Windfinder and WindGuru, both worked very well and are very reliable. But keep in mind that the weather in the Med is very difficult to forecast so keep checking and updating the weather as often as possible. While in the Gulf of Saronika the winds were from the NE but very light so we only managed to motor-sail from Piraeus to Aegina to Poros and back to Sounio. This did change later on during our legs through the Cyclades where we had some heavy Maltemi blowing mostly while at anchor. 37°44.5386 N x 023°25.7315 E We anchored in 9ft over sand and weed patches south of the marina and main harbor. We had a short dingy ride to the east corner of the marina where you can tie your dingy hear the small fishing boats. The anchorage is protected from the Maltemi and we had no problems while there for a few days. There is a bus in town almost, walk towards the NW till you get to the ferry dock entrance, the bus stop is at the SE corner, from here you can visit the very nice temple of Afea and the amazing church Agios Nektarios. The marina can handle about 100 boats; this is a good marina to leave the boat for a trip back home and even for the winter months. Most of the islands in the Aegean have a daily or weekly ferry service to Piraeus. The town has a lot to offer with many waterfront restaurants, hardware stores, one chandlery, groceries, fish market and even a well-stocked supermarket found by turning right from the marina and turn left on the first street, keep walking another 500 m and you will find it on your right. We anchored closer to the mainland Peloponnesus at Galates only 300m from the dingy dock. It is well sheltered from all points. The town has very good provision, including a very nice fish market a small supermarket, and chandleries that can have almost anything brought in the next day usually from Athens. 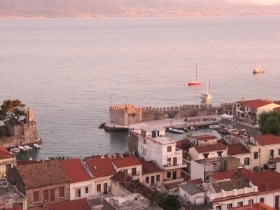 The Chora (old town) located above the harbor is very impressive and very nice walking through it. You can also go stern or bows to the cost for our boat would have been €9.00 not including water and electricity, there is no laid lines so you would have to drop the hook anyways. We anchored in 30ft over sand and weed patches in the shadow of the Temple of Poseidon. We only planned to stay the one night so we did not go to shore but the view of the temple all lit up at night is something to remember. The holding is vey good and protected from the Maltemi, but I think it will be very gusty as the gust will find their way around the cape into the bay. Anchored in 30 ft over mud and weed, this is a better anchorage than around at Korissia where the ferry comes in. We tried to get a bus to take as to the Chora but they were not running until mid June. It is a nice little town with lots of restaurants and some provisioning, bakeries but no chandleries. The anchorage is well protected from the Maltemi. This is a very nice bay with clear blue water , sand and some weeds patches we anchored in 23 ft. If the wind pipes up from the west you can go around the peninsula and anchor at the east side of the isthmus. You can drag the dingy on the beach on both sides of the isthmus and walk up to the small church on the peninsula there is also a very nice walk in the valley to the NE of the isthmus, well worth it. We anchored just north of the harbor in 30 ft over mud and weed, the holding is very good, and protection from 360 deg. There is a bus that takes you to the chora on top of the hill, very nice chora with the usual narrow street and old windmills being turned into modern dwellings. There is a great view looking over the bay from near the last church on the very top. You can walk back through marked pathways all the way down to the bay, it is a very nice relaxing walk. We anchored in 15 ft over sand, the holding is very good with protection from the Maltemi. We took a couple bus from here to Kastro which is the chora of Sifnos. It is very nice still using donkeys to transport goods within the very narrow streets of the chora. But checking out the anchorage we found it to be very small maybe one boat and the rest is wide open, a swell was also finding its way to the small one boat anchorage. Therefore do not attempt to go to Kastro to anchor as the bus rides is cheap and very convenient. We anchored close to Nisis Krisoppigi, you cannot miss it as there is a church on the top of the small island, we dropped our anchor in 20 ft over sand, holding is very good but we had a bit of a swell you can also go up the narrow bay but you will have to go stern too shore as this is very narrow, another option is the small bay to the NE of our anchorage, might be better protection from the swell. We only stayed here one night so we did not explore shore. We anchored in 15 ft over clear water with sand bottom, excellent anchorage with all round protection, might get a chop if it turns from the south which is extremely rare during the summer. When the winds went light we anchored near the harbor of Naousa on the south of the big bay at 37°07.4879 N x 025°14.0896 E in 15 ft over sand and some small rocks. This is a very convenient spot to leave your boat and take a ferry to Santorini and visit the Paroikia. We took a one day trip to Santorini that included a guide and coach, it was worth the money we paid which was €55.00/person. The town of Naousa is worth seeing especially at night. Anchor in 10 to 15 ft over sand close to the beach, if you anchor further out the ferries leave a massive wash and will get uncomfortable. This is an ideal anchorage very well protected. The town offers plenty of provisioning and you can get boat parts shipped in over night through any of the small chandleries in town. There is also a good fish market at the waterfront as you walk along towards the east. There is also bus service to the small villages inland, check with the tourist office for the best places to visit and bus schedules, the tourist office is just in front of the ferry dock. You will need a anchor for the dingy to keep it away from the rough concrete wall just past the beach to the right. The weather was calm so we decided to head here from Naxos, we anchored in over sand and weed in front of the beach. This is a tourist town with the usual array of restaurants and bars; we walked the 2 miles to the centre Mykanos, very busy place with tourists bumping into each other, but it was worth going to, it is by far the dirtiest place we have been so far. We anchored in 20ft over sand in clear water, this is just a big bay with several beaches all around good shelter from the Maltemi but nothing also ashore except for a very expensive bar/restaurant. This is one of the nicest beaches with very good protection from west to NE. We anchored in 20 ft over sand and clear water. There are a couple of hotels ashore so some noise from the ski boats during the day buy very quite at night. We passed close to the Island of Ikaria but could not find a suitable anchorage so we kept on going and anchored here in Fournoi. The anchorage is very deep and small so finding a suitable place here was touch and go but we managed to drop the anchor in about 45 ft over sand and weed. Holding is very good; another option is to go alongside the wall in the middle of the bay or stern to the wall on the north side of the bay. On the second day we picked up the one mooring that actually belongs to a local person that owns a large boat but he was away and were told by the locals that we can use it. So we did and boy was I glad as when the Maltemi came here, the gusts were worrisome and the boat would horse around like out of control. It is not a very good place to be during the Maltemi. But other than those few hours we had a great time here walking to the main harbor and town for coffee at on of the local cafés up the road from the main harbor. We anchored in the middle of the bay in 15 ft over sand with very good holding. Some gusts during a spell of Maltemi but not too crazy. This is a very nice anchorage with excellent holding and close to the main harbor of Pythagorean. There is a bus to the capital Samos and also you can stop and provision from the Ldil store close to Samos. We anchored in 25ft of water, over sand with very good holding. This is a very nice anchorage with herds of goats on the hills and along the shore. The water is crystal clear and the holding is excellent in sand. This is the west side of East Bay as there is another bay within to the NE. We picked one of several mooring here but be careful some of them are too close to each other. After snorkeling over the moorings I found some to be very small whence the reason some of them are so close together because they move during strong winds with boats moored to them. This is a very pleasant area with a few more anchorages around the several islands. Ashore you will find a restaurant and a church on top of the hill with great views. Leaving Marathos we headed east towards the island of Patmos with its many safe anchorages. The weather was with us but we had to motor sail as the winds were very light from the north east at 8 to 10 knots. On the way here we explored the anchorages near Kampos and the Skala but we found that the new harbor in Skala has occupied the anchorage area and we didn’t see any boats at anchor here. 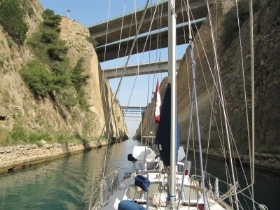 The Kampos anchorage is good but all there is, are resort hotels so we carried on south along the coast to Grikos Bay. We anchored and held on the second try as the bottom is very weedy. Once through the weeds the anchor dug in for good. This also is holiday spot with mainly Italian tourists. Some provisions are available but you will have to pay a premium because of the location. We took a bus from the street behind the beach to the Chora of Patmos to visit the Monastery of St John the Theologian, very much worth a visit. This is a very nice anchorage if you manage to find a spot, we spent 5 days here it is just lovely setting with the medieval fortress and the windmills on top of the hill to the SE of the anchorage. We anchored in 20 ft over sand, with very good protection from the Maltemi, if you do not find a spot here there is a lot more room down the coast about ¼ nm. There is also very good anchorages in the main harbor of Lakki which is on the west coast, we went there by bus and saw several boat at anchor close to the marina. Pantelli Bay. From Pantelli beach you can walk up the hill to Agia Marina where you will find provisions including hardware stores, bakeries and a fish market at the waterfront. This is a well protected bay with spectacular surroundings, we picked a free mooring for the night close to one of the beach restaurants. There is not much else ashore here but it could be a good place to spend some quite time. We anchored in 15ft over white sand with very clean water. This is a huge bay but is well protected from the dreaded Maltemi, there is another anchorage close to the small island of Agia Nikolaous at 36°44.9797 N x 026°59.0827 E in about 12ft over sand. From our anchorage we rented a car for €30/day but not 24 hrs, in other words you pick up the car in the morning and drop it off at 20:00 hrs. It is a good deal because you can do the whole island and stop at the Lidle supermarket that is right on the highway. This is a fantastic anchorage as long as you don’t anchor in front of the opening where you will get hit wit a swell from the west as by this time this area the Maltemi will be coming more from the west. This is a very nice anchorage with the imposing Monastery of Michael the Arc Angle to the east of the bay. You can take a bus from here to the main town Symi to do your checkout from Greece. From here we sailed south and around to the north east of the island and anchored at Pedi Bay: 36°36.8351 N x 027°51.3597 E in 20 ft over a mixture of sand and weeds. Our anchor held us there through a couple of bouts of Maltemi but we did notice that a few boats had trouble and where dragging. The best spot is as indicated above. You can also tie up for free against the south of the jetty, if you tie up at north of the jetty you may have to move as occasionally the ships tie to that spot for unloading of supplies and water. The can take a bus to the town of Symi cost €1.00 and runs every hour at the ½ hour, and back from town on the hour. To check out of Greece you will need to go first to the port police that are located on the south side of the town of Symi then walk or take a taxi around to the opposite side to clear out with immigration. Here we anchored in 40ft over sand, but you can’t see the bottom, very good protection from all sides. You can tie your dingy either at the NW corner of the NE corner of the marina, we prefer the NE corner as it has wood lining the rough concrete. There are quite a few other anchorages around this massive enclosure as it looks more like a lake than the Aegean Sea. In town you will find good provisioning, bakeries, pharmacies and many restaurants serving the charter and gullet clients. There is a bus service to Marmaris at 10 TL per person one way. 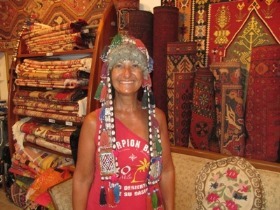 If you are into carpets you will find the best and nicest pieces at The Magic Carpet Gallery and ask for Sonny, he speaks excellent English. To check in you will have to go to the port police whom you will find at the office which is inline with the east jetty, he will get you an agent (compulsory ) and the agent will get everything for you while you wait in there office. The Cruising log cost was €60:00 and the visa costs depend on the passport you own, plus €35.00 for the agent. There are very nice walks around to the SE. We picked up one of several moorings available for free anchored in 20ft over sand and weeds, south of the harbor the holding is not very good so dive over and make sure your anchor is set. We stayed here for four days and had no problems, except when the wind went too light and the chain would get hang on the tall weeds brings boats very close together. There is also a good anchorage north of the harbor. Datca is a big town with a lot of provisioning options. Don’t miss taking a short bus ride to Old Datca, worth the trip to there. We wanted to go to Knodos but we heard that the anchorage is too small so we opted for a bus from Datca which is actually a very nice drive through some spectacular scenery. We anchored in 20ft over black sand but clear water east of the castle, the holding is good but I advise that you dive and check your anchor isn’t caught on some of the debris scattered all over the bottom. We found this anchorage to be very noisy during the night as the hills surrounding the bay create very good acoustics that amplify all the music generated shore side. The town is very nice but busy with tourists. Provisioning is plenty but do not expect to find many boat supplies in town. The best place for boat supplies is Icmeler a short bus ride towards the south east, anything you need or be done can be found here.We anchored in 15ft over sand, with excellent holding. This is a very large bay, not much ashore except a few restaurants. The swell gets in a little bit so keep an eye on the weather if you intend to linger here.Anchored in 37ft over sand and weed, the holding is very good and this is a very well protected anchorage from the Maltemi. It is a very nice quite place to hang around. There is a resort ashore behind the palm trees and nothing else. Anchored in 37ft over sand and weed, the holding is very good and this is a very well protected anchorage from the Maltemi. It is a very nice quite place to hang around. There is a resort ashore behind the palm trees and nothing else. Anchored close to the 33ft over mud, the holding is excellent and you have protection of 360 degrees. There are a few restaurants ashore, plus a small market called Mama Market, they have wifi and where you can sit down on the patio just to relax. The town of Orhaniye is more like a farming community than a town as it is spread over a valley with few houses and no businesses or provisioning at all but it is a nice 7km walk around. The hills are covered with pine trees so it makes for very nice scenery while having your morning coffee. We anchored in 25ft over sand, there is a sand bank that many boats anchor on, it is almost at the entrance and you cannot miss it with good sunlight. The water is clear and the surrounding unspoiled. Well worth a visit here. From Dirsek we explored Sogut at approx: 36°39.5351 N x 028°04.8770 E but found that a marina has taken over the only area that one could just anchor without going stern to. So then we returned to Bozburun for a few days there. This is a very pretty anchorage with some restaurants ashore, but during strong Maltemi it can get rolly. We anchored in 21ft over sand and clear water, in front of the Mehmet’ Place restaurant. We anchored close to Ece Marina in front of Classic Yacht Hotel/marina in 43ft of water over mud. This is an excellent anchorage to leave the boat and go inland for a few days. You can also anchor across the bay but then you have a longer dingy ride. It is not a clean harbor and I wouldn’t swim in it. Most services are available including topping up your diesel at Ece Marina. The town is very lovely and the Rock tombs are very impressive. There is an amazing open market every Friday. You can walk to the market and the rock tombs from the anchorage. We picked up one of several mooring available for free. This is a tourist beach with a few hotels and many tour boats coming and going. One night we had swells coming in from the NE but there was no wind and the boat was hitting the mooring which made sleeping impossible as we tried to tame the mooring buoy. From Turunc we headed the short distance over for our winter spot at Marmaris Yacht Marina. This is an excellent marina with all services available. There is a large boating community organizing tours, walks, billiard, bowling, yoga, etc… Regular scheduled bus services runs every 30 minutes right in front of the main gate and takes you to the city of Marmaris 10 km away.. Bar, restaurant, pool. One can also eat at the fabulous and very clean workers canteen for 7 TL which includes desert. There is also a very nice library with wifi or direct connection internet. Wifi is available throughout the marina complex. There is a lot more anchorages but impossible to mention all of them. We enjoyed every anchorage we visited and would have loved to anchor in all the places available. Maybe next year we will do that.